Pearl grading is a key metric to understand before ultimately making your pearl jewelry purchase. Due to a lack of universal grading standards for pearls, its important for consumers to purchase from reputable and trustworthy pearl suppliers that uphold the highest standards for pearl quality. With thousands of positive customer testimonials online, The Pearl Source has earned a reputation for exceeding expectations when it comes to offering high quality pearl jewelry. High-Grade Freshwater representing the top 10% of a pearl harvest. Found in Finer Jewelry Stores. Very High-Grade Freshwater representing the top 1-2% of a pearl harvest. Heavy blemishing with only a 50% or less clean surface. Minor to medium blemishing with a 70-80% clean surface. Minor blemishing with at least 90% of the pearl surface clean. Very minor to no blemishing with at least 95% of the pearl surface clean. High-Grade Japanese Akoya representing the top 5-10% of a pearl harvest. Found in Finer Jewelry Stores. Very High-Grade Japanese Akoya representing the top 1-5% of a pearl harvest. Gem Quality Japanese Akoya Pearls representing the highest 1% of a pearl harvest. Accompanied by a numbered certificate by the Pearl Science Laboratory of Japan. 99% or cleaner pearl surface with either very minor to no blemishes visible. 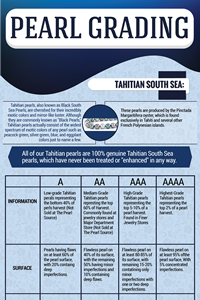 High-Grade Tahitian representing the top 5-10% of a pearl harvest. Found in Finer Jewelry Stores. Very High-Grade Tahitian representing the top 1-5% of a pearl harvest. Pearls having flaws on at least 60% of the pearl surface, with 20% containing deep imperfections. Flawless pearl on 40% of its surface, with the remaining 50% having minor imperfections and 10% containg deep flaws. Flawless pearl on at least 80-85% of its surface, with remaining 15-20% containing only minor imperfections with one or two deep imperfections. Flawless pearl on at least 95% of the pearl surface, with 5% concentrated imperfections. High-Grade South Sea representing the top 5-10% of a pearl harvest. Found in Finer Jewelry Stores. Very High-Grade South Sea representing the top 1-5% of a pearl harvest.